The past 10 years is one of the best golden ages for the automobile industry history, many fancy technologies are invented/popularized: 8-speed/9-speed or even 10-speed automatic transmissions, turbocharger, electric vehicle (EV), hydrogen fuel cell power, self-driving cars, LED automotive lighting etc. 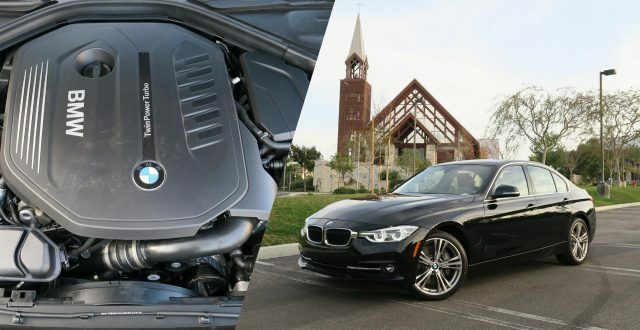 Among these, BMW has used its turbocharge engine technology to start a whole new page, from the ground-breaking N54 and the later N55, N63, N20 etc., to the latest and greatest B-series engine family (B37/38, B47/48, B57/58). 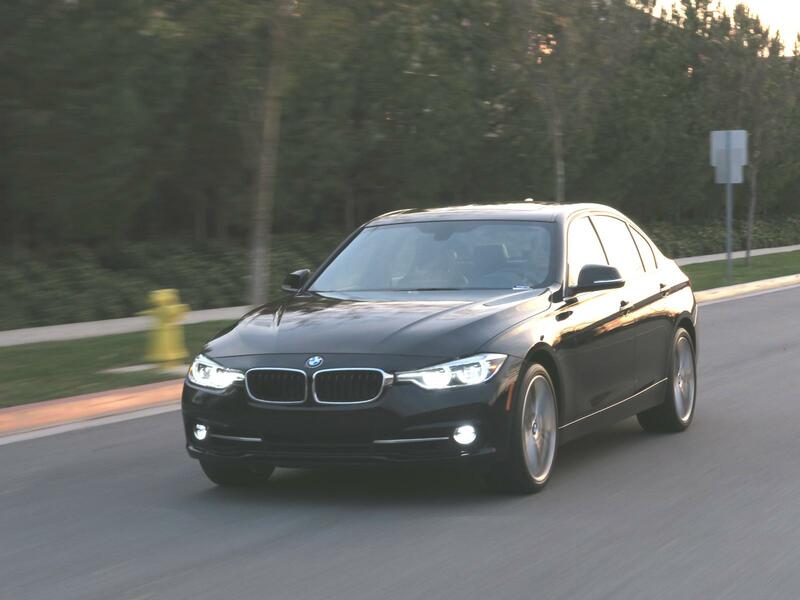 Two weeks ago we published a review on the LCI 2016 BMW 340i. Our focus of the 340i is mainly on BMW’s all-new B58 engine. In this article, I will provide an in-depth review on this engine, based on multiple sources of technical information and also my observation during test drive. Back in the start of the 21th century, there is a trend quietly emerged within the auto industry, which is the desire for power. In another word: people wanted higher engine output. At that time, 6-cylinder engines usually had around 200 hp, and the territory above 300 hp belongs to more high-end engines such as V8/V10/V12 etc. You can see, this is quite embarrassing for BMW 330i: Toyota 2GR-FSE not only has absolute advantage regarding horsepower output, but it also accomplished a big achievement in torque performance : 277 lb-ft from 3.5L displacement, which translates to more than 79 lb-ft per liter. 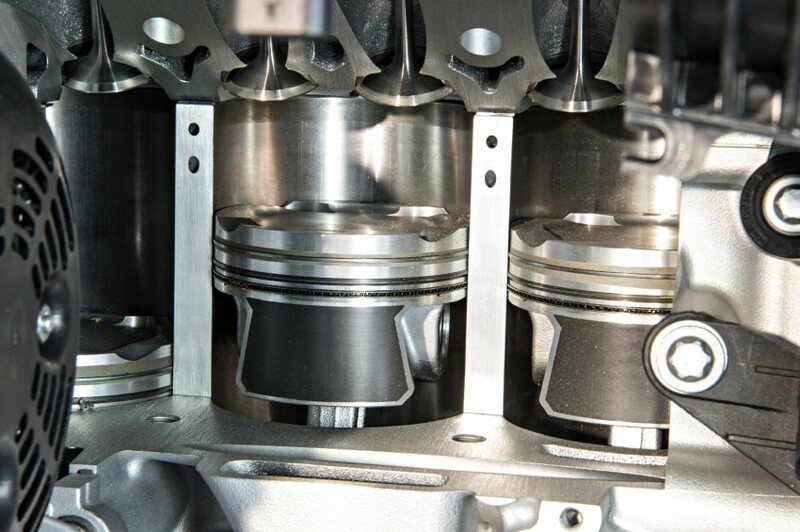 Torque per liter is a very important index for naturally aspirated (NA) engine, because it is directly related to the engine’s volumetric efficiency, which represents the auto maker’s R&D capability. 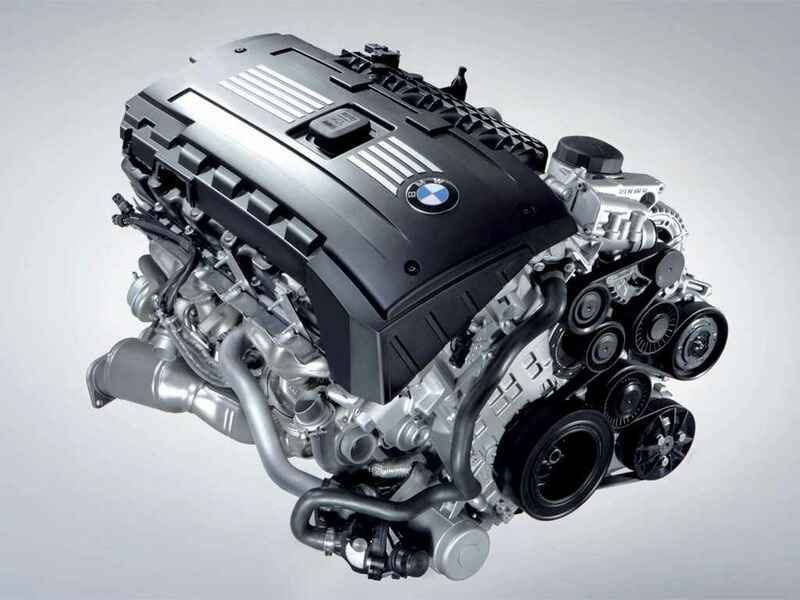 Compared to the 2GR-FSE, the highest tune BMW N53 only gets 236 lb-ft from the 3.0L displacement, which is 78.7 lb-ft/L. Remember, N53 also incorporated the lean burn technology, which 2GR-FSE does not have. 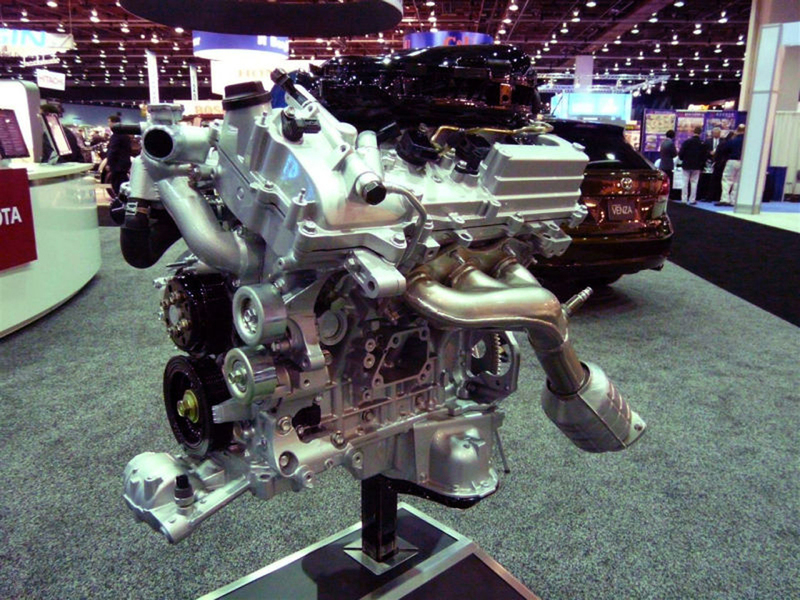 Therefore this indicates Toyota has acquired more advanced design capabilities in NA engines. As a response to Toyota 2GR-FSE, BMW rolled out the N54 twin-turbo engine in the following year. In fact BMW had been secretly developing the N54 for years, and it is playing a bigger game (it went for another route: turbocharging). What BMW had missed is it underestimated its competitors’ R&D progress, which forced BMW to release the N54 engine in hurry. Because of the tight schedule, there were some aspects that BMW later found can be done better. So three years later, BMW released its successor: N55. Obviously N55 cannot be said to be 100% perfect, partially due to its development falls into the period of 2008 financial crisis. 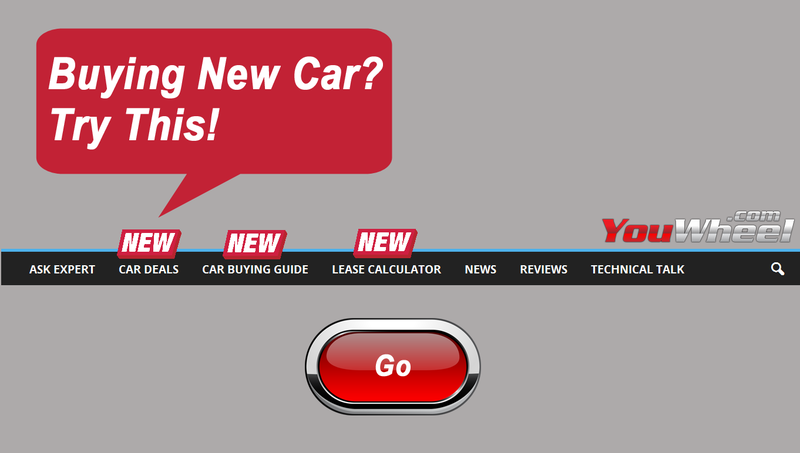 Although N55 does have lots of technical enhancements, in some places traces of economic concern can also be found. The latest B58 engine is totally different than the N54 and N55. It has true performance oriented design, while the previous N54/55 have limited potential which prevents them from taking higher loads. 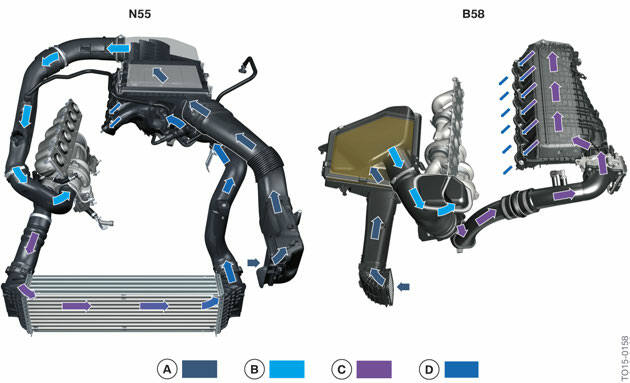 B58 is using air-to-liquid intercooler, compared to N54/55’s air-to-air intercooler. Let’s first take a look at B58’s closed deck design. By nature, closed deck cylinder block is much stronger than the open deck type, therefore it is more suitable for high load and high pressure application. This explains why for the S55 engine (used on M3/M4), BMW needs to convert the N55’s open deck block to a closed deck design. This is also the reason why BMW never officially boost N54/55’s output to over 340 hp (because the block simply can’t take that much without risking its structural integrity). Although B58’s closed deck is structurally strong, it also has shortcomings. 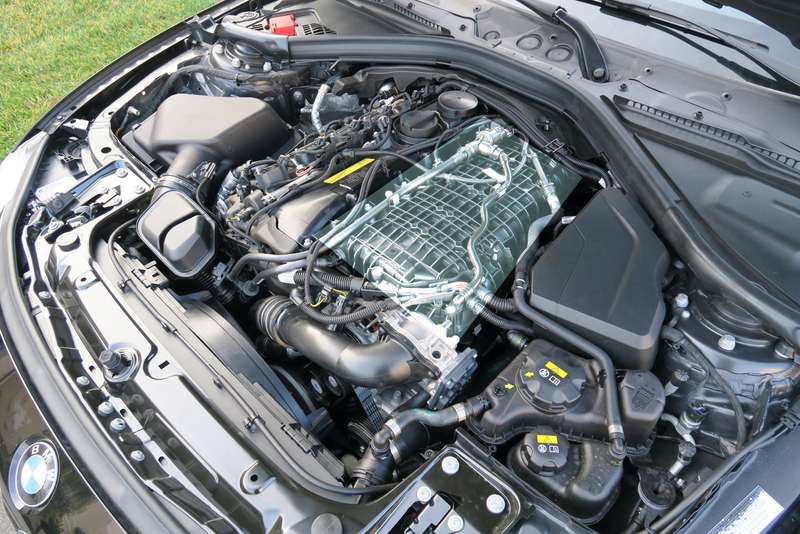 For example it carries a higher manufacturing cost; Also the coolant flow is more restricted, which prompts BMW to use a dedicated heat management module on the B58 engine. On the other hand, this does not mean open deck design is bad. Open deck block is lighter and has better cooling effect, therefore it is more suitable to applications that does not call for high cylinder pressure. The N54/55 uses cast iron cylinder sleeve, but B58 is different: it uses one latest technology called “Electric Arc Wire Spraying”. 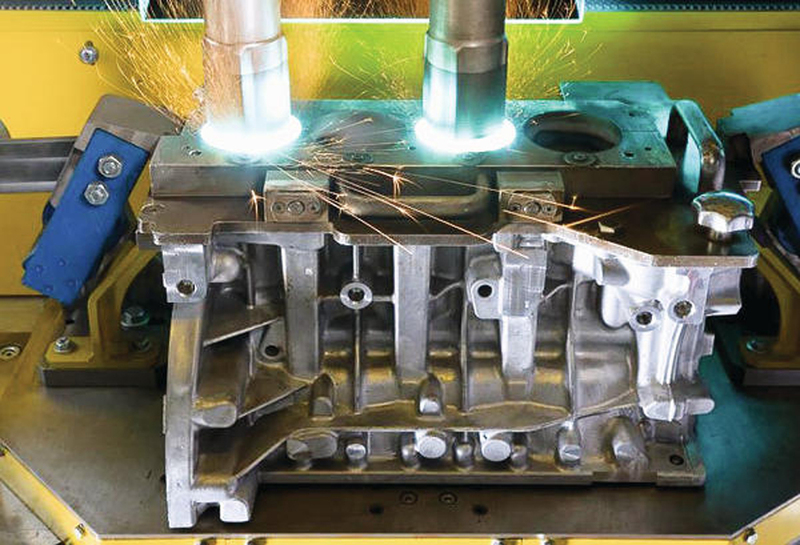 This is a type of the ferrum plasma spray method, which creates a thin layer (0.3 mm thick) of iron on the cylinder wall surface and thus eliminates the need for using the cylinder sleeves. The ultimate goal is to save weight. For your reference: plasma spray is an exotic technique previously (for example GT-R, LFA etc. ), however nowadays its cost is lowered so significantly that even Ford uses it in the EcoBoost engine family. You may also find most of the BMW inline six engines are all undersquare, and this is exactly the same on B58 too. The B58 engine has a bore of 82 mm and stroke of 94.6 mm. The purpose of such geometry design is not for lower-end torque, but with consideration in packaging. Had BMW used a shorter stroke, in order to maintain the same displacement, its cylinder bore need to be much larger. Since here 6 cylinders are placed inline together, this will lead to a excessively long cylinder block, and thus hard to arrange spaces inside the engine compartment, or requires the vehicle to has a longer nose (which is unnecessary for many car models). What’s more, a longer crankshaft (caused by long block) is weaker too. On the other hand, turbocharged engines may be benefited from the long stroke also: because of turbo lag, it is good to have higher torque when the engine is under naturally aspiration mode, which contributes to the driver’s perceived throttle response. With that being said, the B58’s closed deck design seems to cost BMW more to build. However, from the holistic view it is another story: B58 is not a single product, in fact it is a member of BMW’s latest B-series engine family. 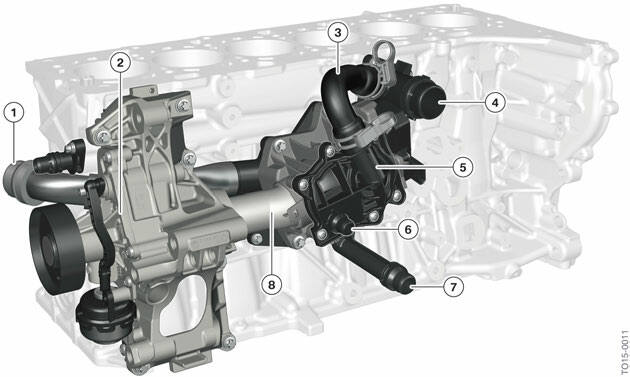 The B engines use the modular design principle: same bore, same stroke, and even same block between gasoline/diesel versions. Therefore, all of these engines can share many of the design and manufacturing process, and ultimately lower the total cost. Next is the intercooler. Almost all “serious” high performance turbo engine use air-to-liquid intercoolers: because it is more effective and more stable. This is exactly the same for the B58. The air-to-water intercooler on B58 is integrated into the intake plenum, which is on top of the engine and sits beneath the cylinder head. Since the intake air no longer needs to be routed to the intercooler in the front bumper (like the N54/55), such compact design brings huge benefit for the B58: the intake path is shortened significantly, which improves throttle response. There are other hints which indicate the B58 is designed as a high output engine. 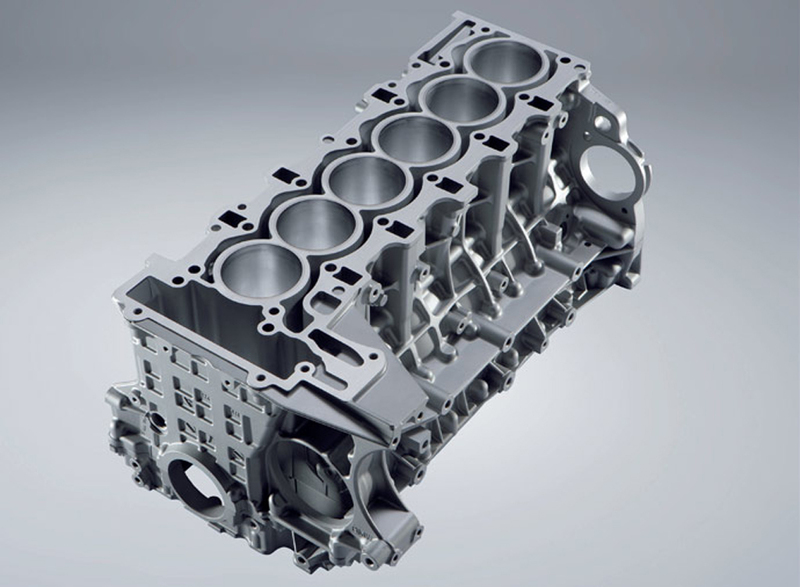 For example its crankshaft is forged, stronger than N55’s casted unit; also the piston connecting rod is also forged on the B58. In one word: closed deck design and also the air-to-liquid intercooler, determines B58 is fundamentally different from its N54/N55 predecessors. On top of the fundamental level enhancements mentioned above, B58 also incorporates many remarkable new designs. These should not be viewed as independent events: they are inter-connected and rely on each other. I will briefly go over some details below. As mentioned above, the B58’s closed deck cylinder causes more restricted coolant flow, and it raises a tougher requirement for the engine cooling system. 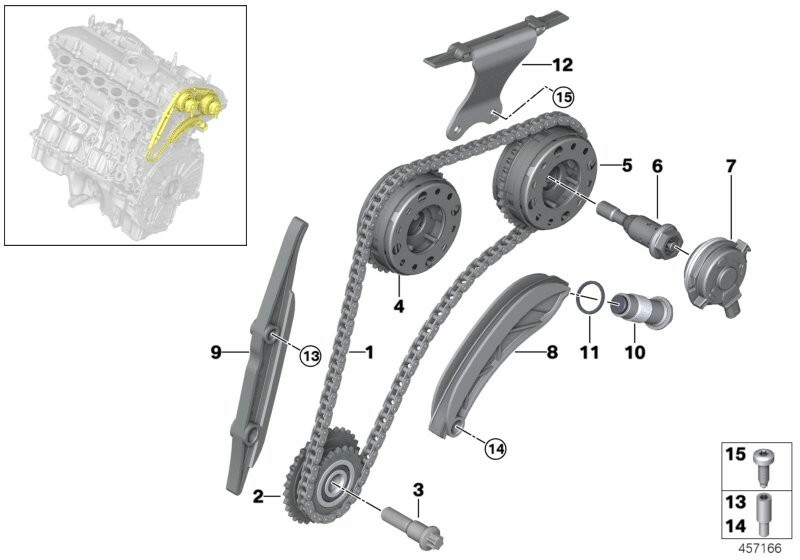 Therefore, BMW uses a so-call “heat management module” on the B58, which is mechanically powered directly by the crankshaft through a serpentine belt. Inside the module, coolant flow rate is adjusted by a rotary valve. 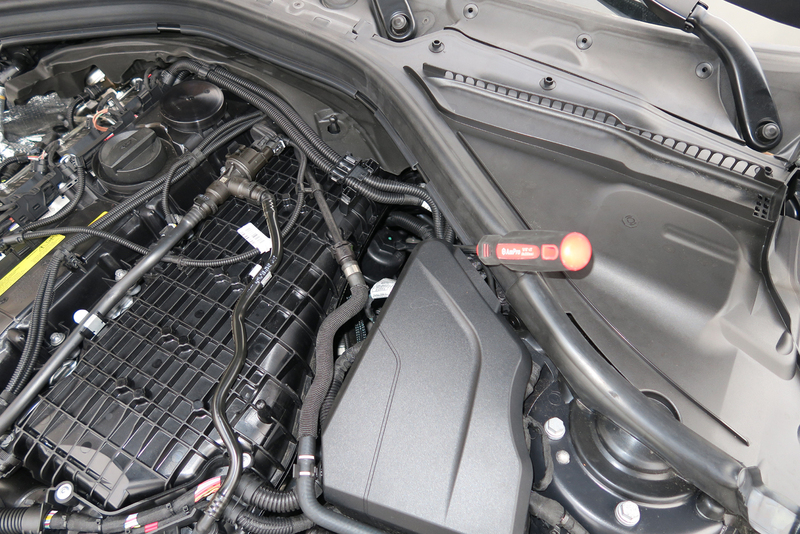 The mechanical coolant pump avoided the hassle of possible failure of the electric type in previous BMW engines. However, to deal with the situation that the turbo still need to be cooled after engine is turned off, an extra dedicated electric pump is added to the turbo unit to tackle this issue. 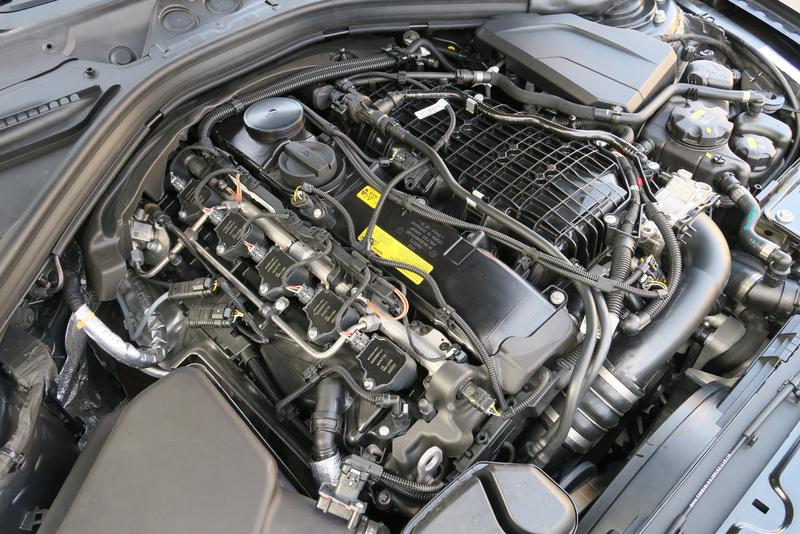 On the N54/55 engine, they place the alternator, AC compressor, timing chain and engine oil filter assembly towards the front portion of the engine, therefore the engine’s gravity center tends to be front-biased. However the B58 treats this differently: it places the oil filter and its radiator, VANOS timing chain to the back of the engine. 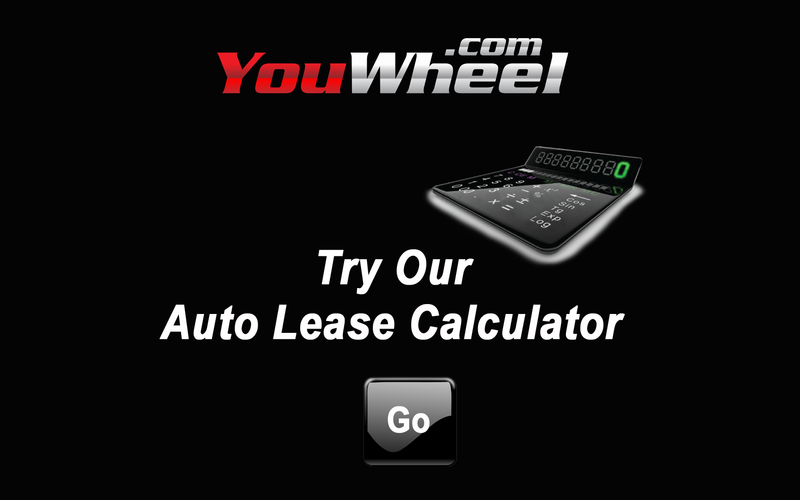 This is good for the weight distribution, however with the price of maintenance difficulty. 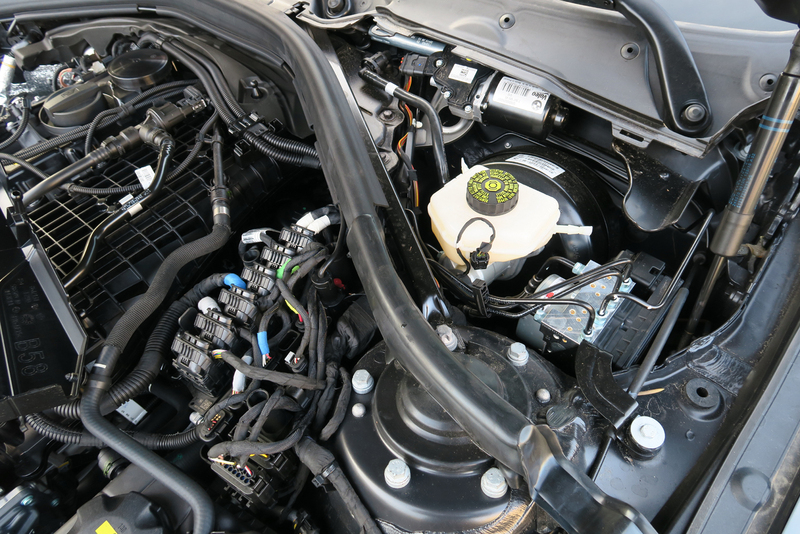 Although the oil filter cap is hiding a little bit deep in the engine bay, it is still not too hard to reach. However, the VANOS system is a huge pain for maintenance: since it is located right behind the engine and extremely closed to the firewall, it is impossible to service the VANOS system without taking the whole engine out of the engine bay. Therefore for those 340i owners that are out of warranty, please pray that the VANOS system does not break. 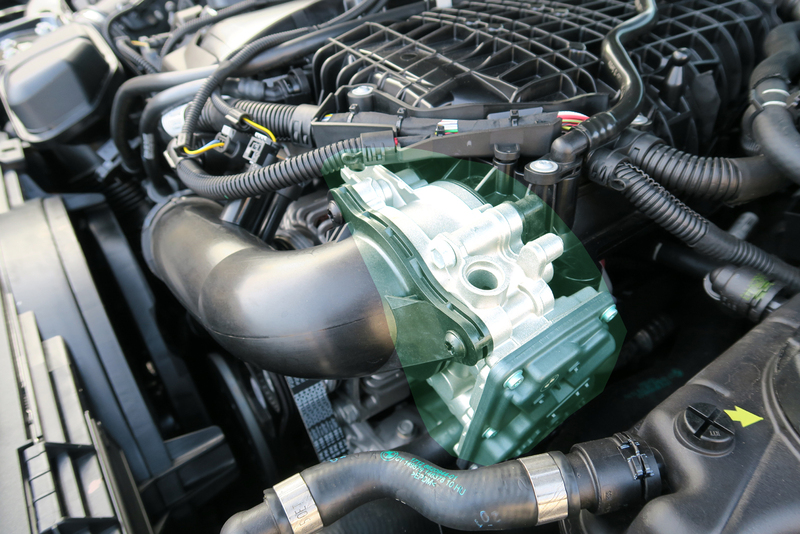 Since there will be noises when the timing chain is operating, BMW placed a sound insulation foam between the cylinder head/valvetrain cover and the passenger cabin firewall. VANOS is responsible for timing adjustment, and Valvetronic is used for control the lift height of the valves and acts as the throttle body. 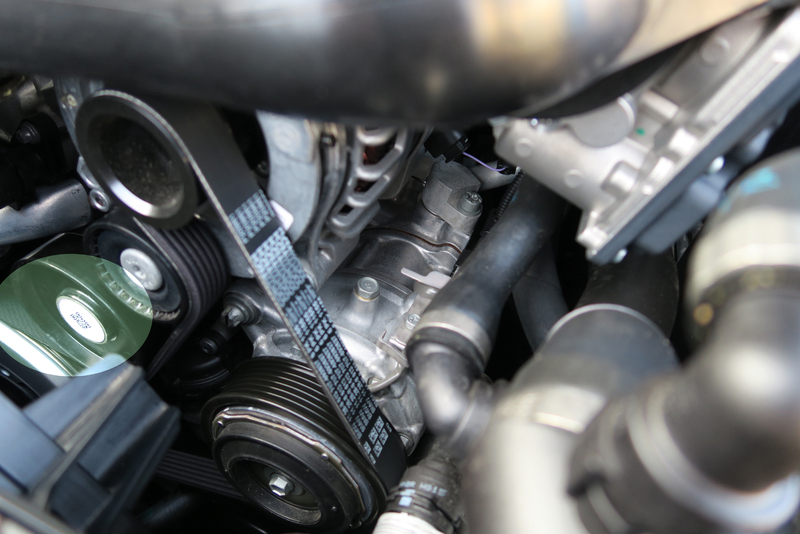 Valvetronic used on the N55 is the 3rd generation, and the one that on the B58 is the latest 4th generation. 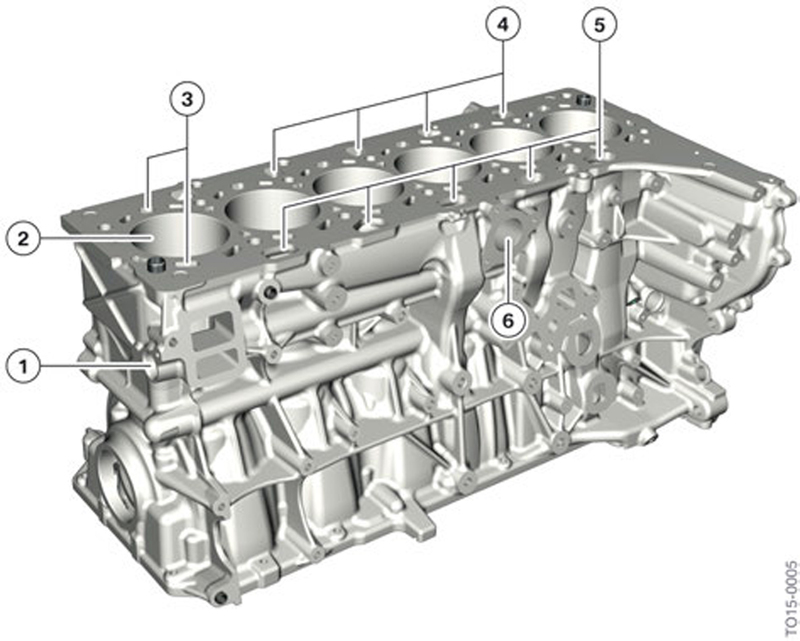 There is no fundamental change in the working principle, the major difference in the B58’s Valvetronic system is it moves the servo motor out of the valve cover (which is N55’s design), and places it outside at the top right hand side of the cylinder head. Such design brings two major advantages: (1) it significantly reduced the installation space; (2) It brings down the engine’s total height and lowers the engine’s center of gravity. Theoretically speaking, a throttle body is unnecessary given the presence of the Valvetronic. However B58 is still equipped with a real throttle body, in front of the intercooler’s entrance. 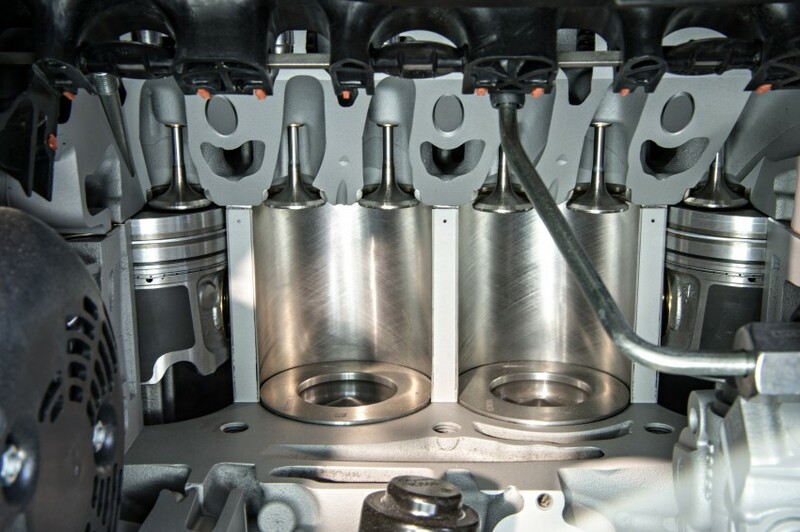 The throttle body’s purposes are: (1) when there is a sudden load change, the Valvetronic mechanism may not react fast enough to adapt to the new operation requirements; the throttle valve can help to provide a seamless transition; (2) a slight vacuum is needed for the engine ventilation; (3) the throttle body acts as a redundant backup in case the Valvetronic malfunctions. One major change to the B58’s fuel delivery system is each of the injector is now bolted to the rail directly, not through an extra high pressure line as in the N55. The benefit is less pressure loss (the longer the path the greater the loss) and slightly faster and accurate pressure control. The B58 is still using the solenoid valve injectors, not the more expensive piezo unit found in the earlier N54 and the current N63 engine. 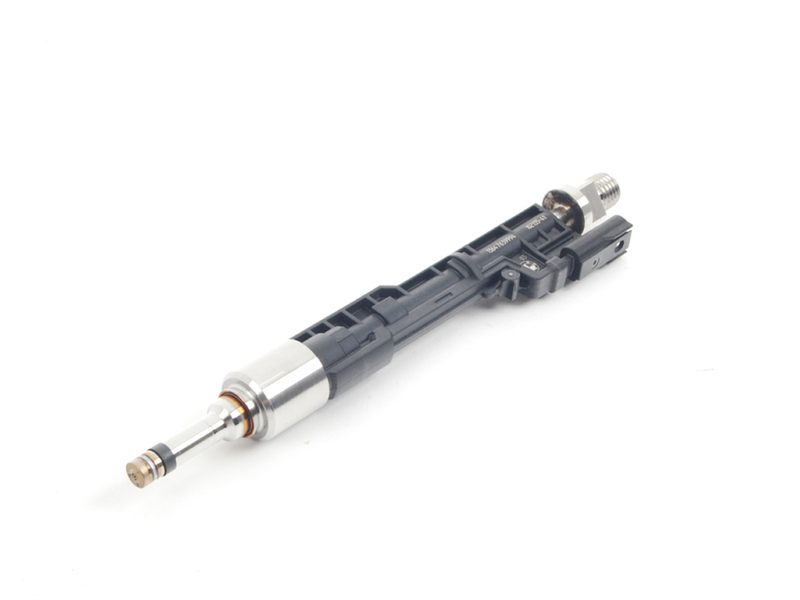 The reason of not using piezo injector is due to the high sulfur content in US market’s gasoline, which makes implementing the “lean burn” feature impossible. The B58 is still using a twin-scroll type turbocharger similar to the one on the N55, however it is larger in dimension. Compared to the unit on N55, the B58 turbocharger has a 6% larger turbine, and the compressor wheel diameter is also 10% larger, therefore the B58 gains 20% in boost pressure. 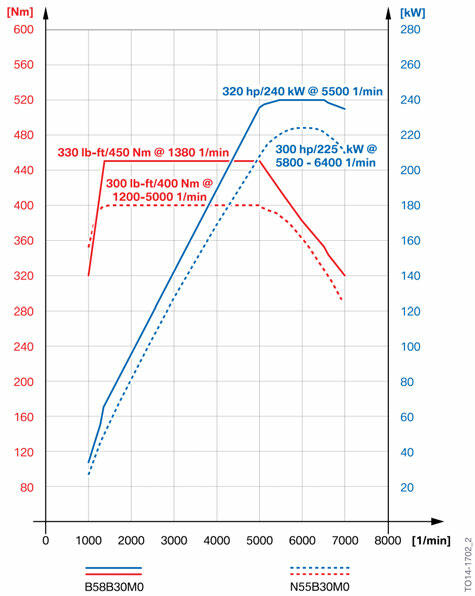 From the below official power/torque curve chart, the power output has a plateau area after 5,000 RPM. This is most probably due to artificial limiting logic in the ECU software, or BMW plots that curve on purpose – since any “unconstrained” power output should be a smooth curve, not with such an abrupt plateau like this one below. 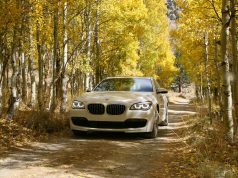 Therefore this indicates the B58 should have a high output version (and in fact BMW now offers the M Performance Power Kit on 2016 340i, which boosts the B58 to 355 hp and 370 lb-ft). The B58 engine’s turbocharger utilizes an electrical actuator to control the wastegate valve; this is a different approach than the N55 engine, which uses a vacuum-controlled charging pressure control system. 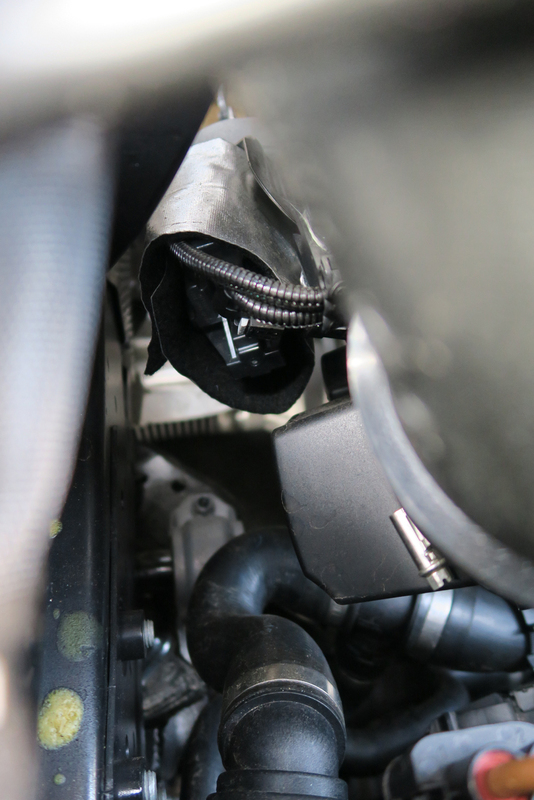 However because of the high heat generated from the turbocharger, on 340i’s application, BMW places a heat shield around the electrical actuator component. 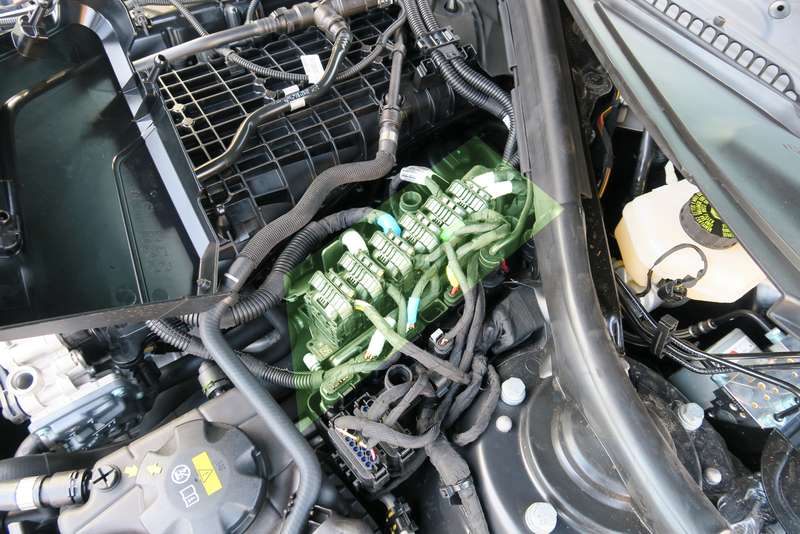 It is a BMW tradition to place engine ECU in the vehicle’s engine compartment. 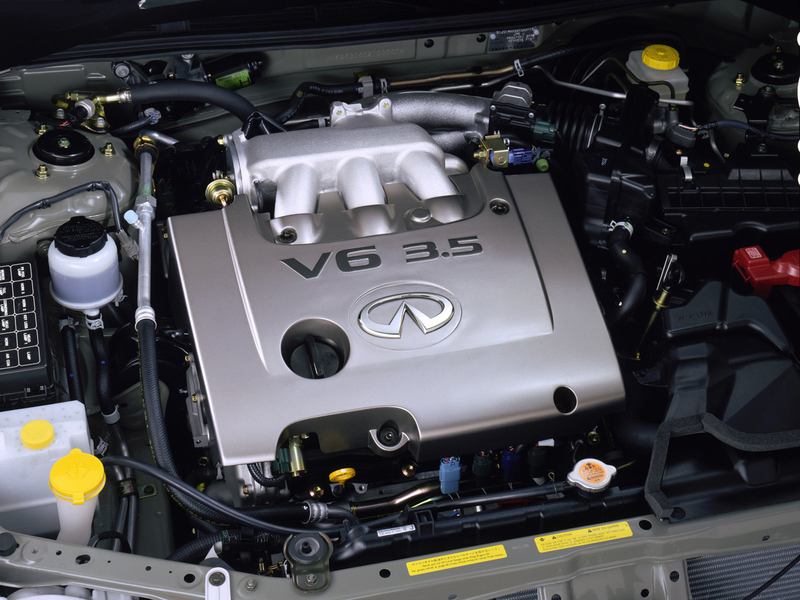 On N55 the ECU is located under the intake plenum and therefore, cooled by the intake air. For the B58 engine the ECU location is moved out of the engine, and it sits just beside the driver-side strut tower. I noticed that electrical plugs/sockets around the ECU are not sealed, it does pose a concern in terms of long term reliability under various weather elements. 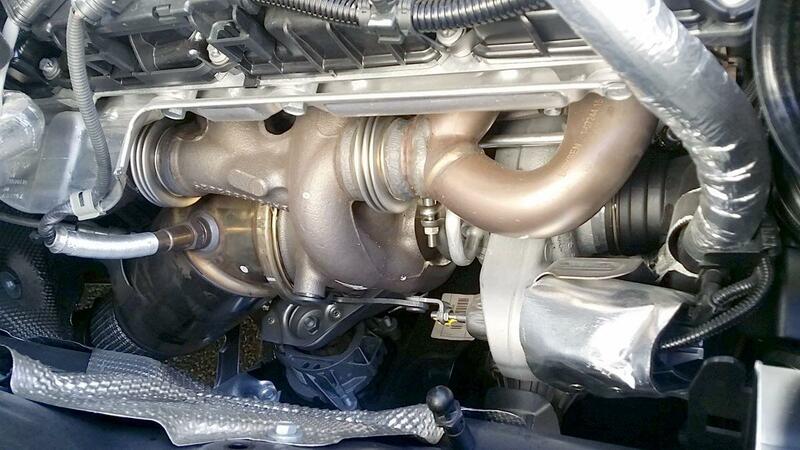 You can see how the ECU is located between the B58 intake manifold and also the 340i’s driver side strut tower. 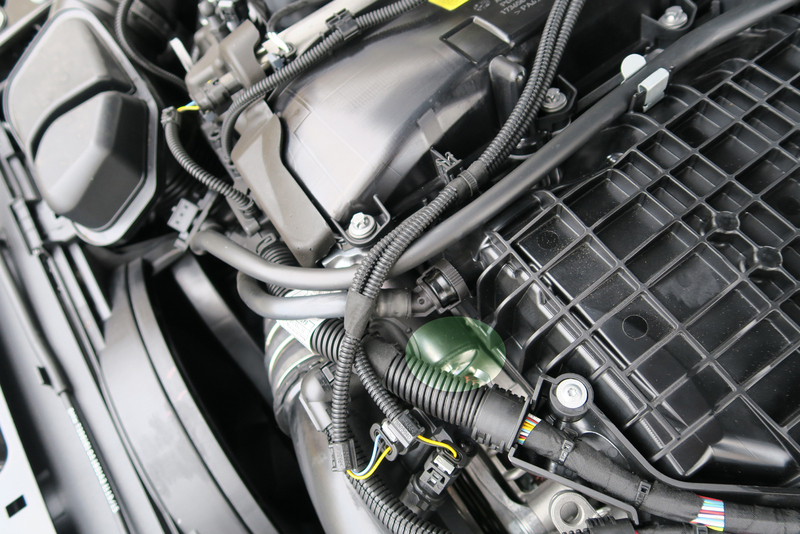 The B58 engine represents the BMW’s latest powertrain technology: new architecture, new design ideas, new approaches. The closed-deck design and also the integrated air-to-liquid intercooler grant it absolute advantages over the previous N55. From our 2016 340i test drive, the B58 powertrain provides unprecedented quick throttle response, the feel of turbo lag is so faint that it is almost impossible to be perceived in daily driving conditions – you have to use transmission’s manual mode to detect it. 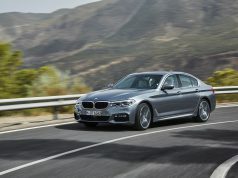 With the B58 engine, BMW finally regains its power to compete in the 350hp 6-cylinder engine sector, against Mercedes-Benz’s M276 DELA30, and also Audi’s new 3.0T V6 (to be used in the 2017 S4). Thank you for a well written article, a rare find theese days. I just acquired a 340i and am just getting familiar with it. In the engine compartment photo entitled “Highlighted section is the air-to-liquid intercoolers” in the lower right there are two tanks both with caps having yellow tags. Both have what looks like coolant in them. I believe the one with the large cap is the engine block/radiator reservoir. What is the smaller tank for? The owners manual is not up to date for this engine and I would like to know about that tank. Just picked up a ’17 340i M Sport a few weeks ago, I’m coming from an ’08 335i with the N54 Twin Turbo. So far so good, still breaking it in so I can’t compare power yet but I can say the 340i sounds better. Just acquired a new X3 M40i (265 kW / 355hp / 369 lb./ft.) So I have the same question as Jim K. : What is the purpose of the second cooling system? Is this the cooling loop for the intercooler, or possibly an isolated system for the electrically cooled turbo? Also, what is the actual boost pressure on the M40i version of the B58? Directly comparing the B58 to the N55 the greatly reduced turbo lag is apparent, as is the additional low/med range torque. Thanks for the detailed description of the engine. 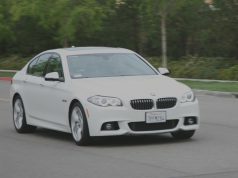 Initial view is that the B58 is the more refined unit – the N55 was more fun and punchier. When B58 is through the 1200 mile mark I’ll give it the beans and report back. The clutch on the 335i (DCT) is way the best. incredible info. Thanks for doing such an in depth analysis of the technical changes. Please do more of these types of articles. This type of info is really difficult to come by, it gets weighed down by all of the BS, speculative forum posts. To have all of this info in one place is frankly awesome.